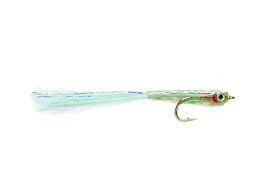 Along with the Minnow's these great Baitfish patterns are ideal for drawing in the predators on the flats. When 'on' they'll be sure to strike and when they do, you can rest assured that thanks to our insistence on only using high quality (Tiemco 811s) hooks, they'd stay there too. Our advise is stock up on a wide range for your trip so you've got a well balanced armoury when the moment comes to rig up your rod and wade out there.